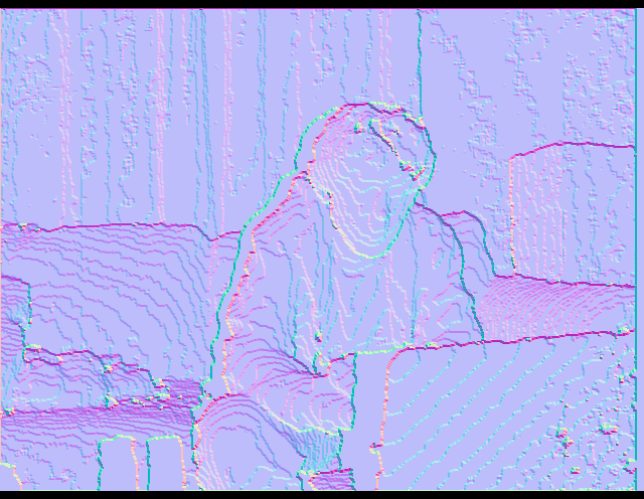 It doesn't look like much to people that don't know what it is, but FINALLY a normal map (http://bit.ly/NjQem) from the greyscale depth map of the kinect, or heck, greyscale maps in general, using Core Image and not other tech. *Infinite thanks* to a certain someone for stirring around my brain cells...still more work to be done on it. Excited for eventual potential. After looking at more normal map examples to check, I've examined the CI process more. The difference can be seen below by the coloring on the ridges. I'm undecided because the top image is giving me correct lighting with further processing, but I've seen some depth map samples that look more like the one below (basically, edges to right appear more greenish and edges above look more red). When I render that further with shader, it gives an inverted edge for me. I'm happy to have this step done either way, and I guess I'll be deferring the first color process for what I have going with QC currently.